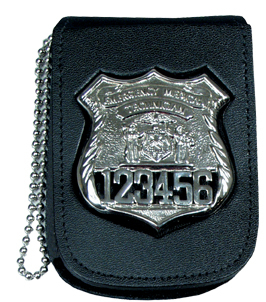 Recessed Badge & ID Holder with 30" beaded neck chain | 700745, PERFECT FIT WALLETS, Recessed Badge & ID Holder with 30" beaded neck chain | McDonald Uniforms, Inc. Maximum ID size: 2-3/4" X 3-5/8"
This case has a recessed coutout to match your badge style. Please include in the "Customization Tab" the badge style number, or a detailed description of it. You may also send a fax or email photo of your badge with dimensions shown.